There should be a rule that there's no such thing as too much pink. In the case of this birthday card, that's the truth! The light pink background complements the other bright colors perfectly, and the dark pink wording really ties the whole look together. The confetti and balloons offer a fun, light-hearted element, perfect for the birthday girl in your life! 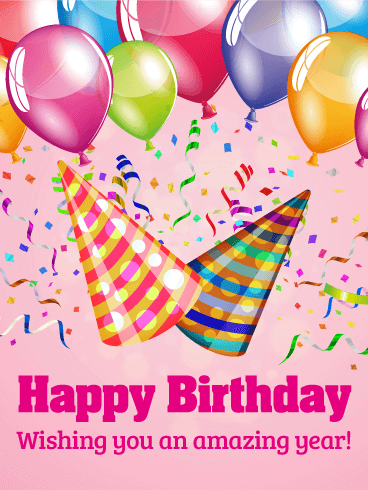 Happy Birthday - Wishing a happiness year! Just look at those bright, gorgeous flowers! This birthday card is sure to bring a smile to anyone's face. Whether you're looking for the right birthday card for your teacher or colleague, or searching for one to send to your mother or sister, this is one that can't be beat. For some extra brownie points, send along a bouquet that matches the birthday card... or include some flower puns in your note! The delicate design of this birthday card is absolutely breathtaking, and it's the perfect choice for someone special in your life. The flowers are plentiful without being over-the-top, and the soft colors add the perfect touch of elegance and beauty. This birthday card is eye-catching enough to make a mark on anyone's special day, but vague enough to be tailored to anyone whose special day it is. Flowers, flowers everywhere! If you're having trouble finding an amazing birthday card, look no further. These flowers look so realistic and bright, while the butterflies add an element of whimsy. This birthday card is a great choice for everyone from your mom to your co-worker, and everyone in between! The sentiment is sweet, and the picture is simply beautiful. 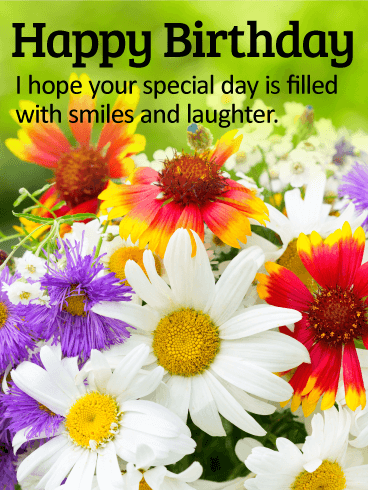 Do you have a friend or family member with a spring birthday? 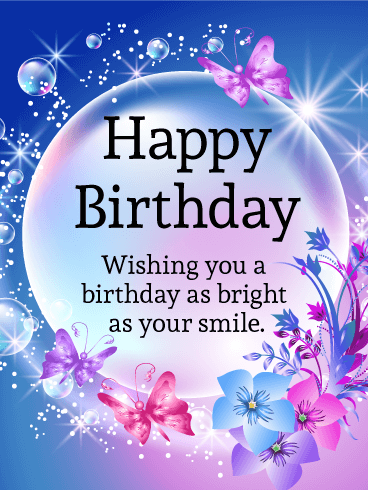 Then send this bright Happy Birthday card! Pink tulips mean good wishes and daffodils symbolize the start of spring, so this is the best card to send to this person! 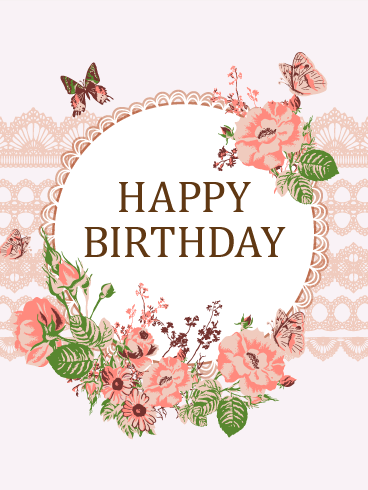 Wish your loved one a wonderful day, tell them how much you love them, and say "Happy Birthday" with this beautiful birthday card! You can never go wrong with flowers, especially for someone's birthday! 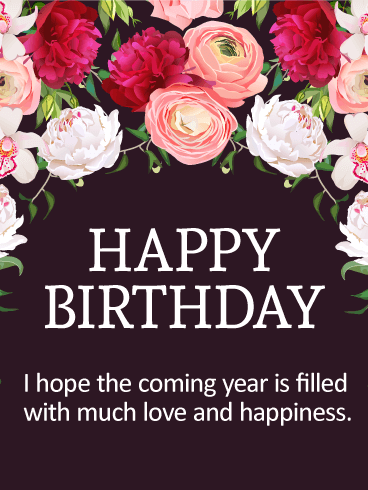 If you want to send the idea of flowers without, you know, actually sending flowers, this birthday card is a great option and a must-have. The colors are simply stunning, the sentiment is genuine and heartfelt, and the background is the perfect balance of simplicity and elegance. Make your friend smile every time they think of you! That's because this birthday card is so amazing, filled with so much love, that the good wishes it comes with will last an entire year! Each rainbow balloon float with happiness, and your friend will too. Up, up, and up until their happiness fills the sky. Wish them a wonderful year! This is a perfect choice for anyone who could use a little relaxation on their special day! 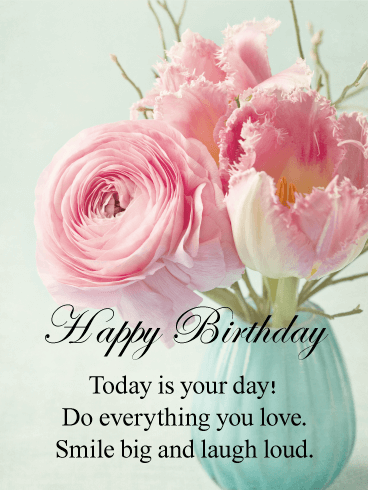 The soft colors and quiet detail of this birthday card make it the picture of luxury and calmness, something everyone wishes for on their birthday. 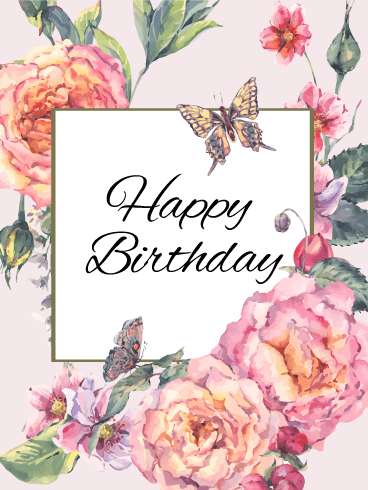 The detail of the background pattern is stunning, and the flowers and butterflies add a simple elegance to this card that's unlike any other. Birthdays are one of the best days of the year! 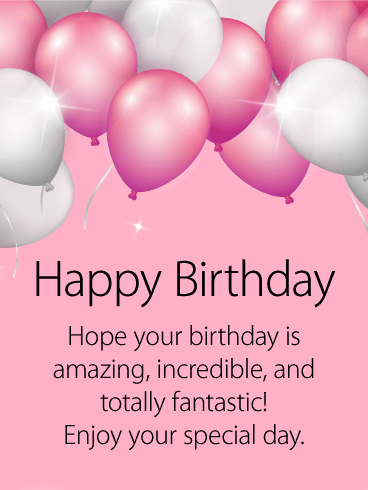 Help your favorite birthday girl's day be extra special by sending this magical Happy Birthday card! The brilliant sparkles, fancy butterflies, shimmering bubbles, delicate flowers, and beautiful colors will make this her favorite card! 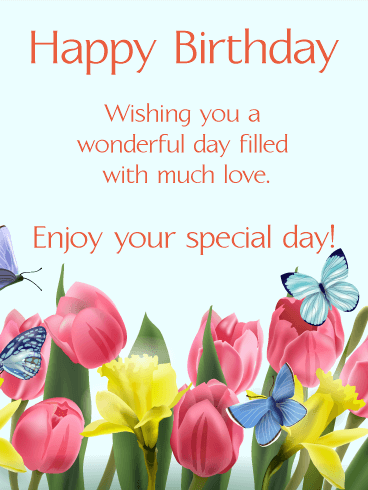 Make her birthday an amazing day by sending your birthday wishes and affection with this birthday card. 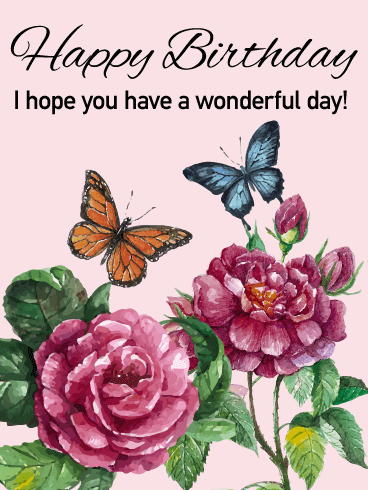 Graceful beauty and pure elegance merge to create this stunning birthday card. 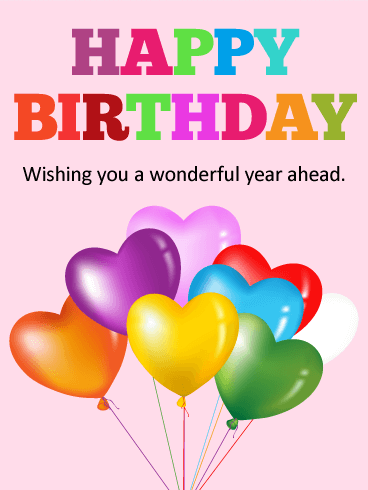 A truly special birthday greeting you can send today to someone special in your life. It's a lovely and simple way to wish the happiest of birthdays. Blushing pink and baby blue leaves cascade among the bursting, golden flowers to help make their birthday a joyous occasion. We know that birthdays only come but once a year-so make it a great day with the perfect birthday card. 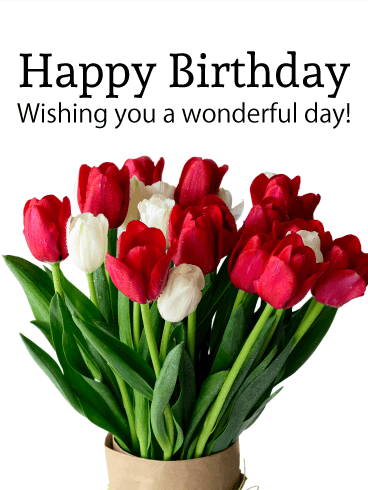 For someone special in your life celebrating their birthday, this birthday card with gorgeous tulips is a stellar choice. 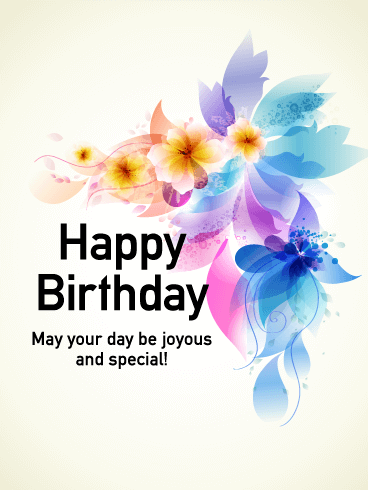 The birthday card is simple but elegant, with beautiful colors that immediately catch the eye. The verbiage is ambiguous enough to be used for anyone, from a work associate to a friend, so this is a great birthday card to always have on hand for birthdays.